The Zero to Product workshop, held at the Hackaday Design Lab in Pasadena two weeks ago, was a packed house of talented people seeking to expand their skill set with professional PCB layout tips and tricks. [Matt Berggren] didn’t disappoint, bringing his professional experience to the table in a way that anyone with basic electronic knowledge can grasp. 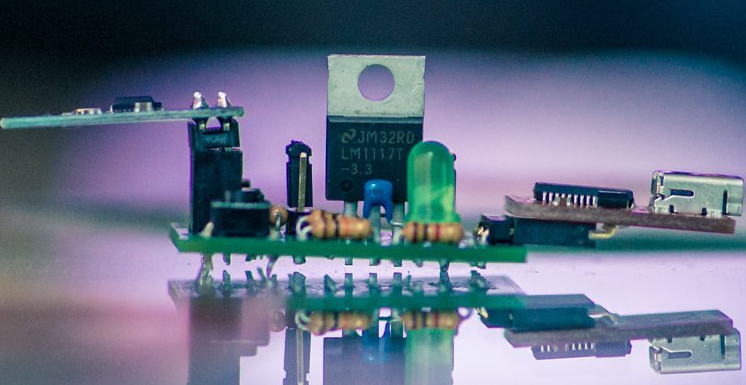 Learning the things that make a board reliable and manufacturable can be done with a simple design. In the case, the culmination of the workshop is development board to host the ESP8266 WiFi modules that have been so popular over the last half-year. This isn’t the first time we’ve pulled off a massive hardware hackathon and meetup, and it certainly won’t be the last. You have another chance to participate in the workshop in San Francisco on June 13th. If you can’t catch that one, we’ll be in Shenzhen for the Shenzhen Maker Fare, a Zero to Product workshop, and a meetup. Of course Hackaday events are never “all work and no play”. The day crept into night and the the chairs were cleared out for hightop tables and tasty beverages. The atmosphere was festive and everyone still made it back early the next morning for an entire day of hardware hacking, tinkering, and general futzing around with circuits and electrons. If you check out [Rich Hogben]’s photo log of the weekend, you’ll find some an impressive collection of hackers were there. I see at least one person who’s job is flying space probes, a Hackaday Prize judge, and a security researcher who can crack a Master Lock in 30 seconds. The meetup Saturday night wasn’t technically a bring-a-hack event, but we walwasy want to see people’s latest and greatest contraptions. [Steve Collins] brought a homebrew LIDAR. This project was based on a SparkFun Time of Flight breakout board that scans the room with a cheap hobby servo, reads the data into an Arduino and displays the rangefinding data on a small TFT. The LIDAR is good enough to scan the entire Hackaday Design Lab, with more than enough resolution for any robotics project you have in mind. We rented Galaga and Ms. Pac Man machines for the entire weekend, but that wasn’t the only electronic entertainment for the party. Two Bit Circus was there with a game that could only be described as highly disorganized electronic chess. FLED, the exceedingly large, high-resolution RGB LED display was behind the bar, and Deezmaker took over a room to 3D scan people and print out miniature clones on a pair of 3D printers. 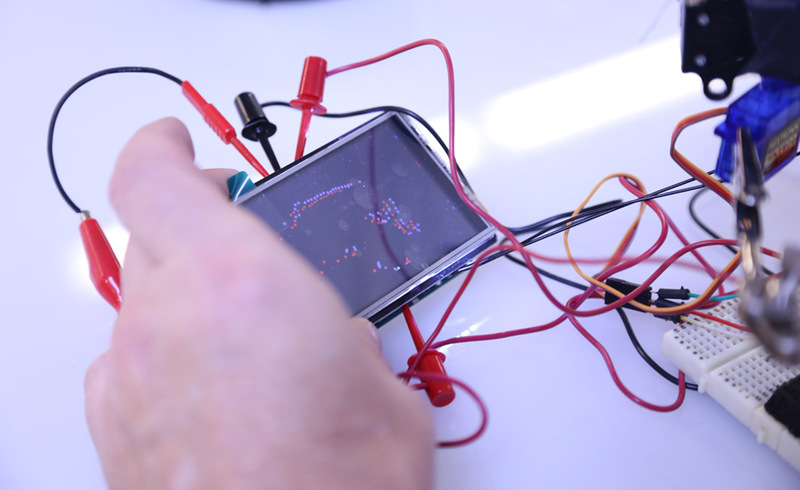 The events continued on until Sunday evening with a hardware hackathon. This isn’t your run-of-the-mill software hackathon where people sit behind their MacBooks the entire time; we had soldering irons, components, solder, solder wick (important!) and dozens of hardware hackers tinkering away at their latest electronic doodad. The amount of hardware on hand was spectacular. 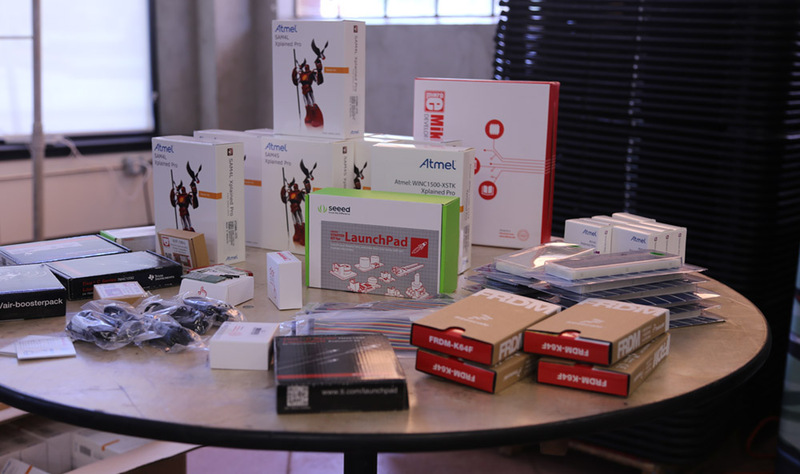 Hackaday Prize sponsors Atmel, Freescale, Microchip, and TI all provided some hardware. Everything from ATMega328 boards from Atmel, TI Launchpads bristling with goodies like the Sharp Memory Display booster packs, Seeed Studio starter packs, to insanely powerful Freescale Freedom boards were available to build on at the event. The Sunday hackathon also had several gigantic boxes from Mouser filled to the brim with components and breadboards available to everyone to clobber into submission, letting their inner electronics geek shine. When taking a break from the build there was plenty to look at. People were showing off already completed projects they brought along with them. [Jeff] from Circuitry & Poetry was there with a bunch of circuit bent synths. A number of people were also finishing up the ESP8266 breakout boards that were presented the day before; some soldering and some laying out a PCB in Eagle. It was an incredible event, with dozens of groups going off to do their own thing, but still welcoming to anyone else who wanted to tinker. This type of community isn’t found everywhere and we’re thankful for the people that make Hackaday events like this one so special. We need to take the time to give a big shoutout to SGVHAK. We honestly couldn’t have done this event without them. I’d personally like to thank [Michael Proctor-Smith] for bringing his amazing livestreaming box. He is the reason I am not currently (still) editing down seven hours of video from the PCB design workshop and the lightning talks. Big ups to [Lan], [Scoops] and everyone else who helped out. 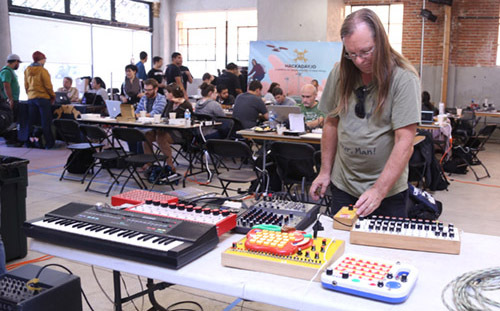 If you came to the Hackaday event, check out their meetups. If you’re in the area, we also have regular informal meetups somewhere around the hackerspace. Come on out! We are doing a lot this spring to get people elbow-deep in hardware hacking. We have so many live events coming up that we’re going to be doing Saturday morning recaps to keep you informed. Here are the upcoming events should be planning to attend if you’re nearby. We hope you didn’t miss our announcements about the Hardware Hackathon we’re putting on in New York. It starts this afternoon and runs all night and into Sunday. If you really want to get in on the hacking we might be able to help you out (hit us up on Twitter). But you can also show up on Sunday to see the results live. Tickets for that are available here. Next weekend we open up the Hackaday Design Lab of Pasadena, California for a workshop, talks, and a day of hacking. This is the Hackaday Prize Worldwide: Los Angeles. Start out on Saturday with the Zero to Product workshop which will discuss getting from design to production. Interspersed with this are a set of talks from amazing presenters before a bit of social time at night. On Sunday we open our doors for Free Build and hope to see a ton of people working on their Hackaday Prize entries. RSVP now! Seeing everything at Bay Area Maker Faire means a lot of time on your feet. By the end of the day the Hackaday Crew is ready to take a load off and toss back a tasty beverage. We invite you to join us on Saturday, May 16th starting at 7pm. All the cool kids will be there so please RSVP now. It’s not compulsory, but a lot of people bring hardware they’ve been working on to show off at this meetup and you should too! Every year our friends from NullSpace Labs organize the LayerOne Conference in Los Angeles. This is LA’s premier hardware security conference. This year Supplyframe is sponsoring the badges and Hackaday will be camped out at the Hackaday Hardware Villiage. [Brian Benchoff] and [Mike Szczys] will be hacking their own badges while looking for awesome hacks other people are pulling off. We’ll bring plenty of swag and want to get everyone there to try at least some level of badge hack.